A printable list of 25 healthy toddler snack ideas perfect for the big and little kids in your family, including Mom and Dad too! My favorite kind of snack: one the whole family shares in a “snack plate” style! Note the boys usually hog the hummus and crackers! Today I’m talking about my toddler’s favorite subject: snacking! I’ve included many of these in my 50+ healthy meal and snack ideas for kids, but figured I’d branch out with a few more of my kids’ favorites. Which comes just in time for back to school, back to daycare, back to LIFE and set schedules for many families now that summer is almost over [sorry, I know that’s not the best news for the kiddos but most parents are excited!]. I’ve pulled together 25 healthy snacks for kids that my toddlers will vouch for. When it comes to balancing out our snacks I always try to include one to two of the five food groups. When I get wild and add more, then the snack becomes more like a meal— and results in my boys not wanting to eat their lunch or dinner. One change we’ve made to our snacking routine is to SIT while we snack. We’ve started snacking in the kitchen or sitting on the porch. I’ve found when we snack while playing instead of sitting, the boys eat more than they really want or need! All snacks are appropriate for kids, parents, and grandparents. I just titled it for toddlers because that’s the stage my kids are in! Make sure you space out snack and mealtime, or else your kids might not be hungry for lunch or dinner. I’ve actually found by skipping the afternoon snack the boys eat a lot more of dinner! Or they ask for one of these snacks instead of their meal… go figure! To ensure the snack is NOT the size of a meal, I use these small bowls to portion out the snacks and give them ¼ to ½ of what my serving would be. If your child is snacking well but not eating at meals, try eliminating snack time. Or diverting them to do something else to see if they are really THAT hungry. If so, then try making the snack a smaller size. And when snack time seems never ending, use it to your advantage to get more fruits and veggies in your child’s diet, by only offering those things before a meal! Can you tell he’s thrilled to be eating a cold green bean?! 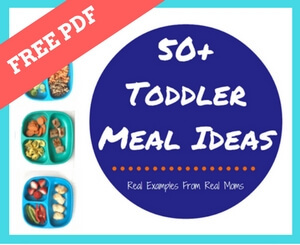 → Click here to download the PDF of 25 toddler snack ideas and print-off a copy for your bulletin board or pantry door! You can also PIN this image to save for later! If I’m missing one of your toddler’s favorite snack, feel free to share below! We can all use new snacks in our repertoire. Here’s to healthy snacks that are perfect for toddlers—- and just as delicious for parents. For you know, those moments when the kiddos want to share…. Want more tips when it comes to handling snack time with little ones? Table Talk: Tips and Tricks for Feeding Young Children might be the resource you are looking for. Get your copy today! Very helpful could do with some more recipes and list of sugar free foods. I’m working on the list as we speak! Great idea Linda! Thank you for the post. This post helped me select Mumumco Snacks for my kid brother. I almost dislike every healthy snack but he liked Mumumco snacks. Visit https://www.mumumco.com/ for more.